Ghosts and Ghouls lurk throughout the night on Halloween, BEWARE, BEWARE as they come looking for gluten-free fare!! 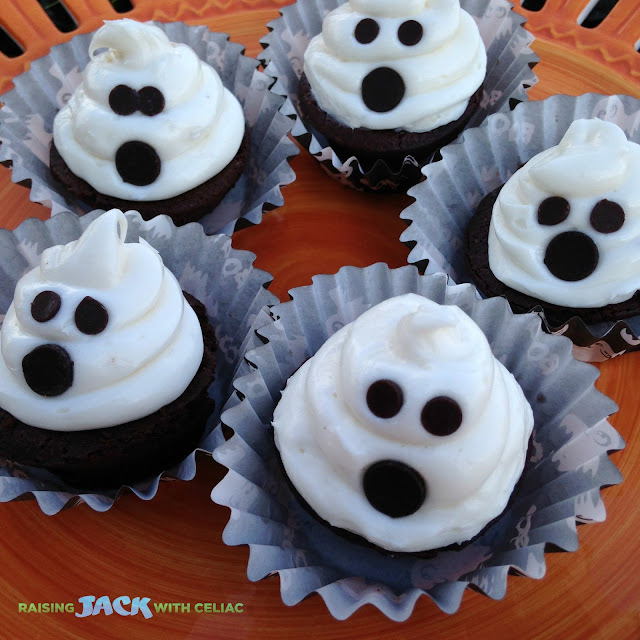 Ok, I'm totally lying, there's no such thing as ghosts and ghouls, I don't even know what a ghoul is, but I do know one thing, you can make some tasty gluten-free/allergy friendly treats for your friends and family this Halloween! I've teamed up with some AWESOME gluten-free/allergy friendly brands Canyon Bakehouse and Enjoy Life Foods to make some delicious Halloween Brownie Treats! If you aren't familiar with these brands, they're pretty amazing! Canyon Bakehouse is a dedicated gluten-free company that makes amazing gluten-free breads, bagels, buns and brownie bites. Many of their products are free of dairy, soy and nuts too! Enjoy Life Foods makes cookies, bars, baking mixes, plentils (like chips) and more in a dedicated nut-free and gluten-free facility. ALL of their products are FREE of the Top 8 allergens. I wanted to share something that other kiddos with food allergies could have as well! 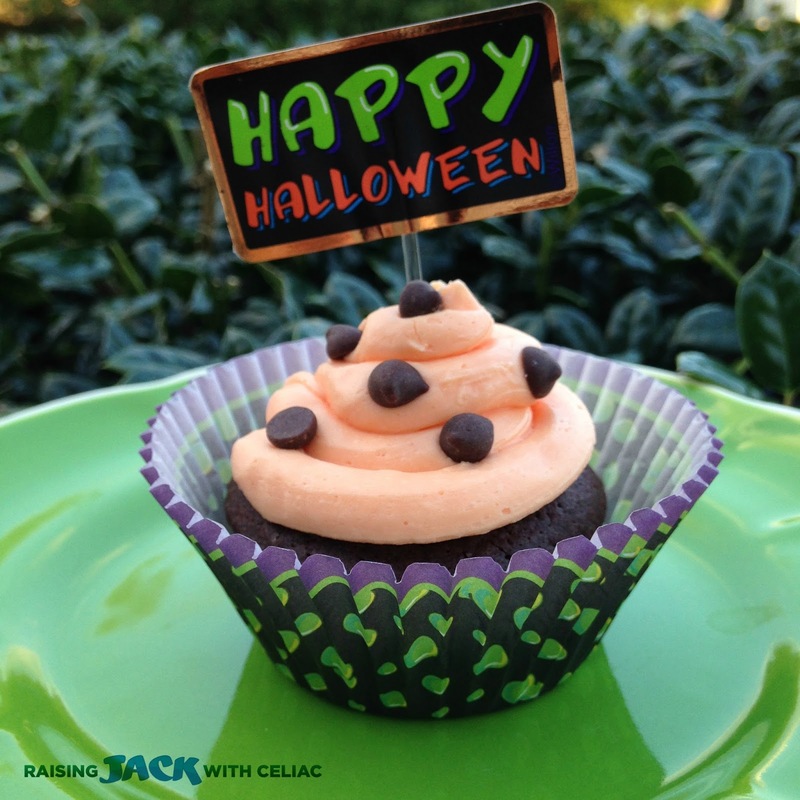 We can ALL COME TOGETHER for a Halloween party where EVERYONE can enjoy some delicious gluten-free/allergy-friendly treats! Let's get started - 1st up, my colorful Halloween Brownie Treat! 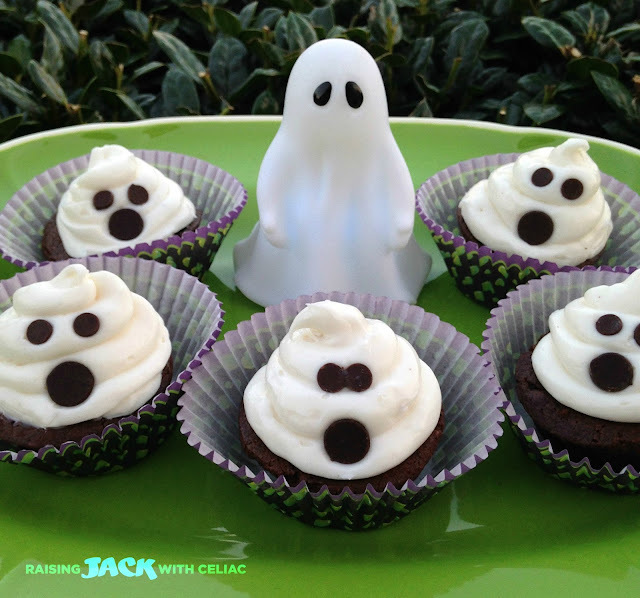 Next up, now don't be scared...my GHOST BROWNIE TREATS!! The key to making "ghosts" is 1) I put my frosting in the fridge before I use it, so it's easier to work with. 2) I use a plastic baggie and cut the corner of the baggie and use it as a piping bag. 3) LASTLY, MOST IMPORTANTLY, when making your ghosts, you put a mound of frosting in the middle of the brownie bite and circle around it with your frosting - that helps the frosting to stay upright. Adding some props to your brownie treats display makes it EVEN SCARRRIERRR! Again, not really, but A LOT OF FUN! 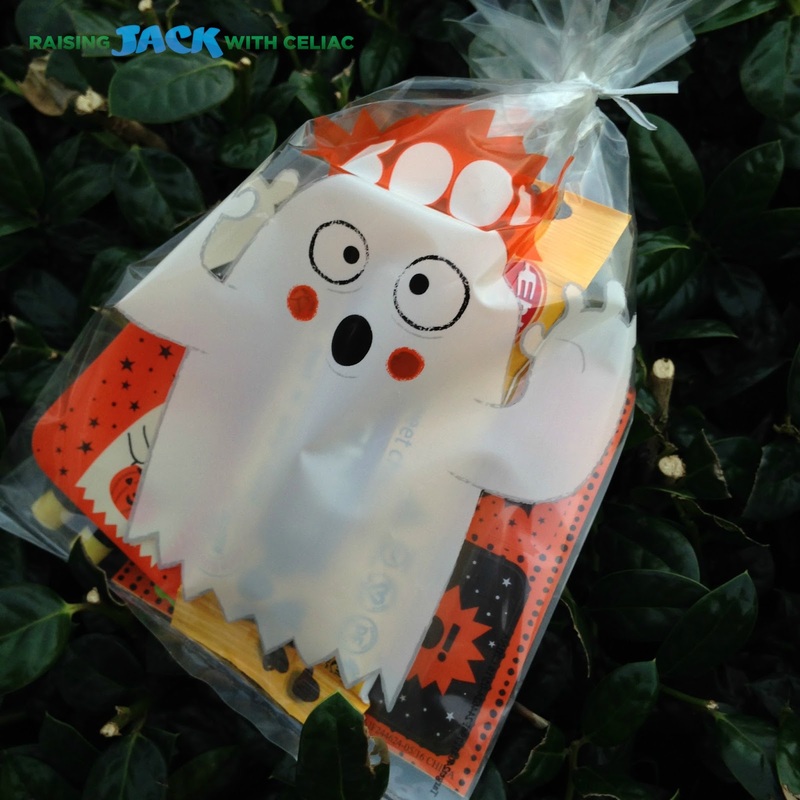 This particular ghost lights up and changes colors which I will share on Raising Jack's Facebook and Instagram pages, so make sure to check it out! It's SO COOL. 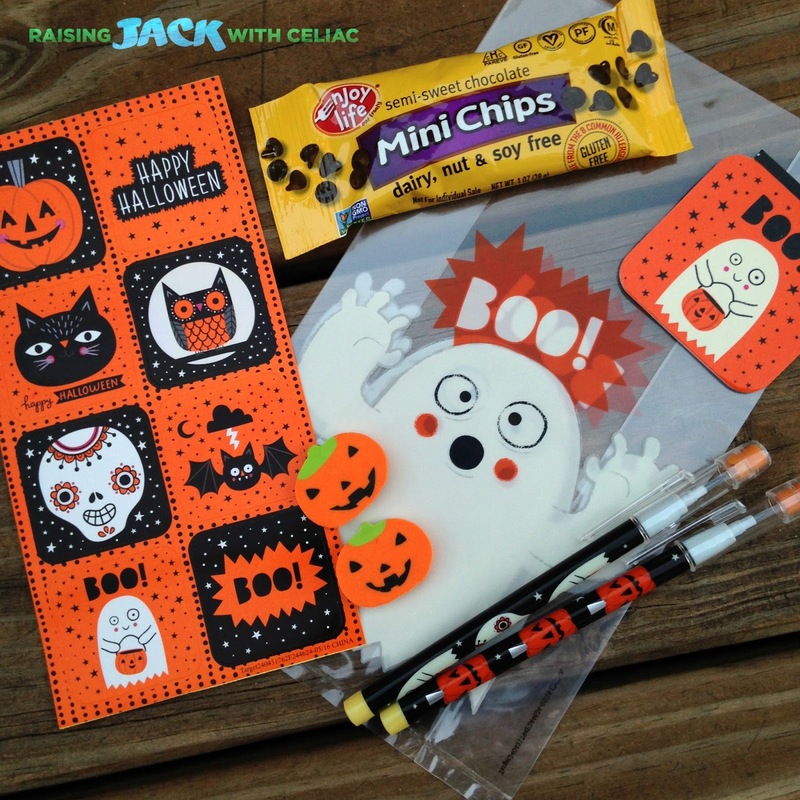 And for the kiddos to take home, you can hand out these Allergy-Friendly Halloween Treat Bags! 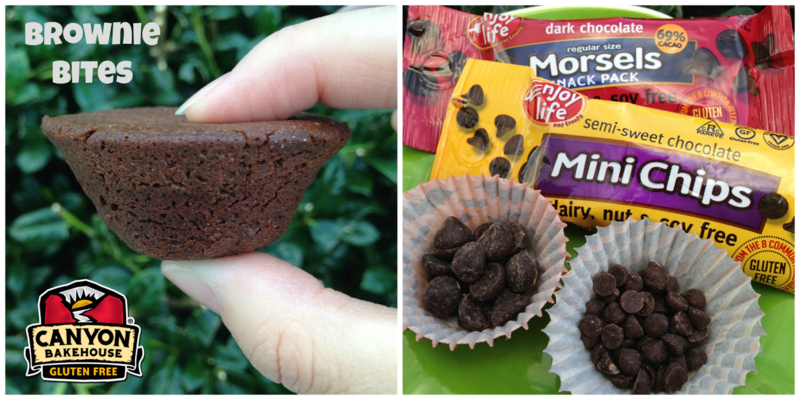 Enjoy Life Foods Mini Chocolate Chips Snack Packs fit perfectly inside! The kiddos can just tear the snack packs open and pour the chocolate chips right into their mouths...at least, that's what I do. There you have it my friends, a GHOST OF A GOOD TIME with Canyon Bakehouse's gluten-free Brownie Bites and Enjoy Life Foods Chocolate Snack Packs! BUT WAIT, THERE'S MORE!! How would love an opportunity to WIN some Brownie Bites and Chocolate Snack Packs?! 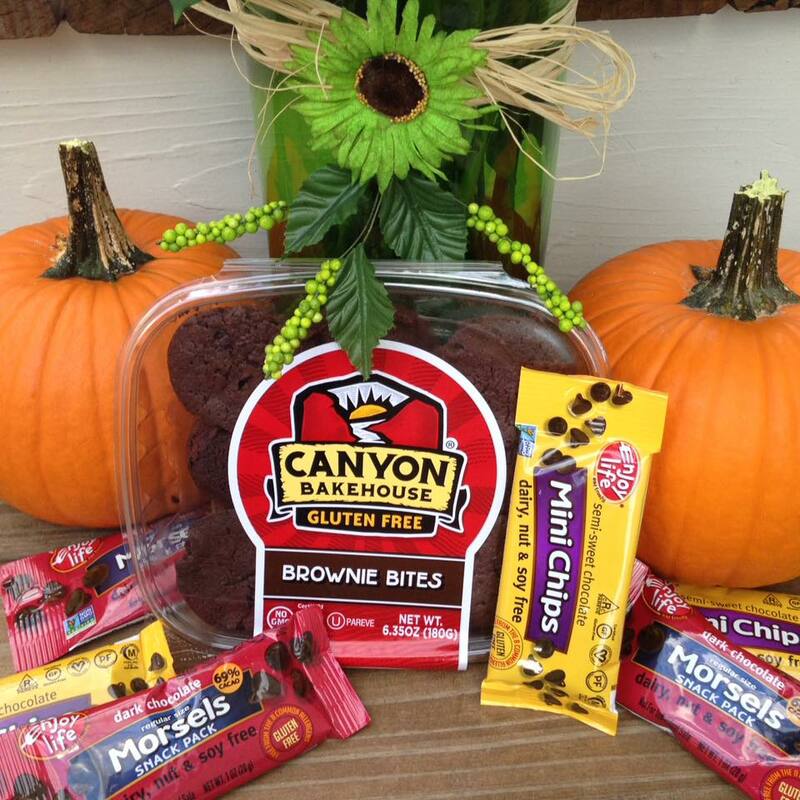 ONE (1) WINNER WILL RECEIVE ONE (1) PACKAGE OF CANYON BAKEHOUSE BROWNIE BITES AS WELL AS SOME ENJOY LIFE FOODS MINI CHOCOLATE CHIP AND DARK CHOCOLATE MORSEL SNACK PACKS! THREE (3) ADDITIONAL WINNERS WILL RECEIVE A TREAT BAG LIKE THE ONE YOU SEE ABOVE. **This is a sponsored post with Canyon Bakehouse and Enjoy Life Foods. I have received compensation and/or product from these brands. All opinions are my own and I only work with brands that my family and I truly enjoy. 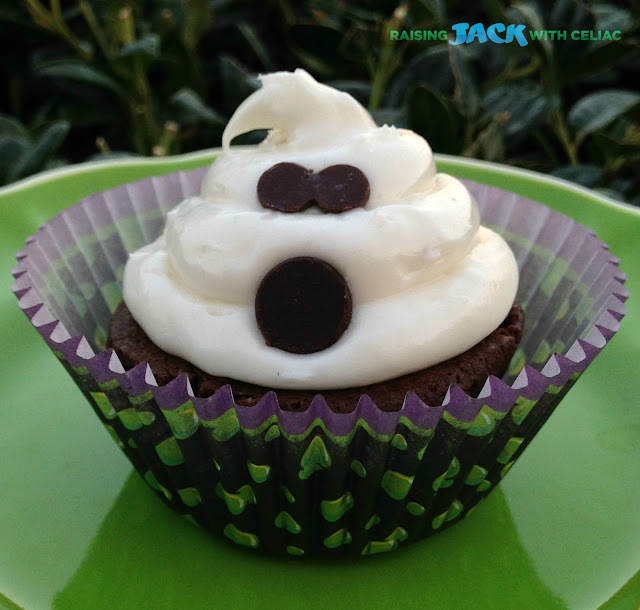 What an easy cupcake idea! Popcorn balls for halloween, with a little orange food coloring....every year since I was 7! Your post is so exciting! Gives us great ideas for Halloween and your pictures are beautiful! I love to make gluten free meals for my daughters friends. They're all so surprised that gluten free can be GOOD! I think I will make a trifle this Halloween. I love this blog. Down to earth, real suggestions. Thank you so much! My daughter was just diagnosed with celiac and your posts are amazing and so helpful! I want to make rice krispy pumpkins (gf of course!). Decorated Sugar Cookies & cupcakes! We always have so much fun adding colors and designs to them! I love to make ghost toast! I use gf bread, cut it into a ghost shape with a cookie cutter and sprinkle it with cinnamon and sugar! I love making dirt cake. I like making eyeballs using black olives and cream cheese. I used to make a little graveyard with veggies and bread tombs, etc...but it's been ages since I've done that. We don't really host Halloween parties anymore, so it's been a while since I've made Halloween treats...but these look adorable! I make gluten free witches fingers. They look scary but taste delicious. In the past I have just done cookies then wrapped with foil and decorated the foil as a pumpkin. But I plan to get more creative this year as as have so many more options that make it more convenient. Love Canyon Bakehouse (have about 4 packages in my freezer). :) And have been using Enjoy Life chocolate chips for a few years now. This year they have been a life saver for scool snacks with all the new bar, seeds and cookie options.